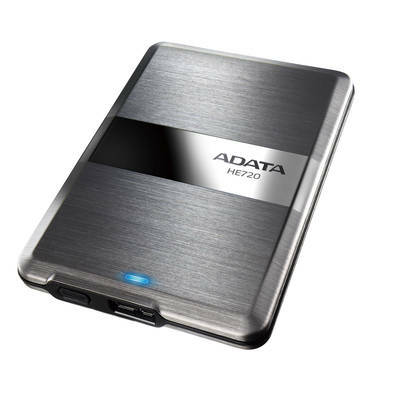 Enclosed by a brushed stainless steel casing and announced as the thinnest external hard drive out in the market, the ADATA DashDrive HE720 is one sleek-looking storage device. Covered by a protective layer with a hardness of 9H, its polished look is sure to last you for a time. ADATA’s HE720 comes out as an answer to Toshiba’s recently announced slim external hard drive. With a thickness of 8.9mm (which just barely beats out the 9mm-slim Toshiba external), the DashDrive HE720 is a striking device to have that offers both looks and performance. The DashDrive HE720 is outfitted with the USB 3.0 interface to make sure that it delivers when it comes to speed performance. A part of ADATA’s new series of advanced storage devices, the DashDrive Elite group, the HE720 guarantees the best design and work output that ADATA has to offer. According to the company’s press release, the external hard drive will be backward compatible with USB 2.0 but will be offering data transfer speeds that are three times faster than USB 2.0. For those concerned with securing data in the drive, there’s no need to worry. The HE720 comes with a 60-day trial of Norton Internet Security 2012 that you can download for free; that should protect your data from all kinds of malicious spyware and adware that make the rounds in the Internet. Rounding out the drive’s security features is its HDDtoGO password protection system. This system takes care of the physical aspect of securing data in the simplest manner: no password, no access. Conscious of the fact that the HE720 is an external, ADATA designed the slim drive to have a “one-touch backup” system that makes backing up data or storing important files an ease. ADATA will launch the first models of the drive in storage capacities of 500 GB. The retail price being thrown around for the external drive is $89.99. That’s about ten dollars cheaper than Toshiba’s slim external hard drive. To further demonstrate the quality craftsmanship behind the product, ADATA will offer a 3-year warranty with the drive’s purchase once it hits the stores. This entry was posted in ADATA Technology, USB 3.0 Hard Drives and tagged ADATA, External Hard Drive, USB 3.0. Bookmark the permalink.